That is correct, Alan Jackson has announced his tour plans for 2017 and country music fans are absolutely ecstatic. Alan Jackson will be on tour in 2017 with Lee Ann Womack (actually she will only be at a couple of his shows) and so far only about 10 concert tour dates have been officially announced. 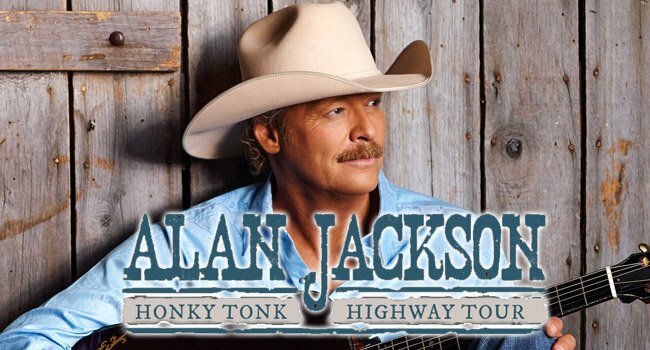 Alan Jackson and crew start off their tour on January 20th at the River Spirit Casino in Tulsa Oklahoma, and ends in late October at the Target Center in Minneapolis; But there’s big date span gaps and hopefully he will be filling those in with many more performances. It’s actually been quite a while since Alan Jackson has been on a regular, headlining tour, but no one here is complaining. He’s a huge icon in country music, and honky tonk music lovers can not be happier. Realize too that he is no newbie to the country music scene, in fact, his first studio album came out way back in 1990 and had released a total of 15 studio records that have helped earn him his spot in country music history. Don’t miss ALAN JACKSON on his 2017 Honky Tonk Highway Tour! Stay Tuned for more 2017 Alan Jackson Tour Dates to be listed as they are announced. There seems to be a lot of open dates for him to add more shows.